Most museums rotate their exhibits, hoping that by placing art in new contexts, they will inspire visitors to look at them with a renewed sense of appreciation. Few are as lucky as Adachi Museum of Art, in Yonago, Shimane Prefecture, where exposition changes every day with hardly any curatorial intervention. The museum’s gardens, considered one of most impressive in Japan, are integral part of the exposition. Founded in 1970 by a local businessman, Zenko Adachi, the gardens were conceived as a living picture. They are meant to be looked at through museum windows of various shapes and sizes. Visitors are not allowed to enter. Rather than walking through the grounds, they are invited to experience the landscape in the same way they view a framed painting on a gallery wall: to appreciate the composition, color and technique, but refrain from touching or feeling the texture. The museum’s glass encased corridors, wings, and open patios frame painterly landscapes. As visitors proceed through galleries, each section of the meticulously tended grounds appear from a different perspective. Adachi, who referred to his garden as "a picture scroll, a living painting,” hoped that an intimate encounter with natural beauty of changing seasons will make visitors’ more sensitive and help them experience art in new ways. Born in Shimane in 1899, Adachi came to fortune as a textile and rice trader. Keenly interested in Japanese arts, particularly modern painting, he amassed an impressive collection of leading Nihonga masters, including Hashimoto Kansetsu, Ito Shinsui, Takeuchi Seiho, Uemura Shoen, and Yokoyama Taikan. It was the latter painter - Taikan — whom Adachi deeply admired and whose works form the core of the museum’s collection. Believing there is a strong resonance between the aesthetics of traditional Japanese gardens and Taikan’s sensibility, Adachi resolved to design museum grounds in such a way so as to complement the painter’s work. Stone arrangement in the Dry Landscape Garden. The three upright rocks in the center represent steep mountains, from which the water falls down into the white gravel in front. To realize his vision he hired Kinsaku Nakane, Japan’s renowned designer and landscape architect, who had previously worked in Kyoto (among others on the exquisite Zen garden of Toizo-in temple), but also China and the United States. Adachi himself also remained closely involved in the project. He personally collected 800 red pine trees (Pinus densiflora) from the mountainous Hokuriku district, as well as stones from Matsuyama, Tottori and Okayama. (Supposedly, when shown his collection of rocks for the first time, Nakane remarked that he did not expect to see anything as fine in his lifetime). Spanning five hectares, Museum’s grounds incorporate six separate gardens, including a dry landscape garden, a moss garden, a pond garden, as well as two tea houses — Juraku-an and the Juryu-an. The latter is a replica of the Shokin-tei in the Katsura Imperial Villa in Kyoto. 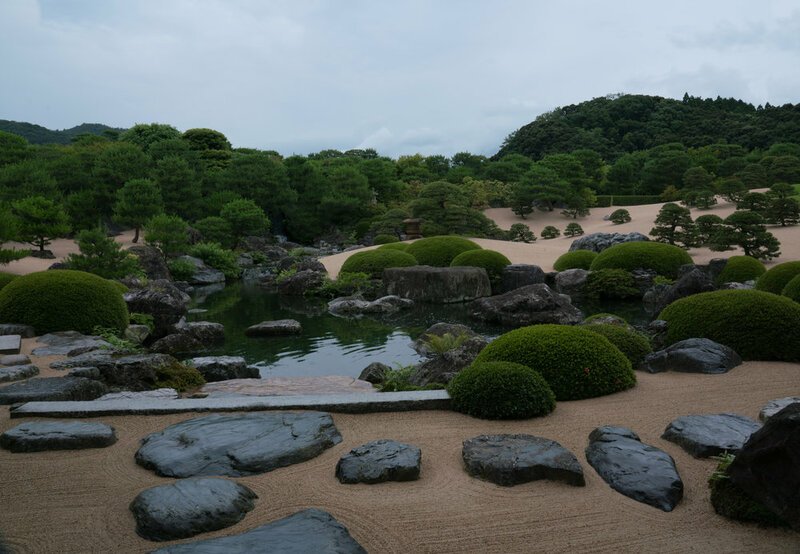 Nakane, who considered Adachi Gardens the most significant commission he had ever undertaken, managed to combine different styles in such a way so that they all flow seamlessly to appear as continuous landscape. The most prominent among the six is the Dry Landscape Garden — a rolling composition of grass, gravel and rocks. As is customary in karesensui gardens, the rock formations evoke a mountain; while the water is symbolized by sand. Visible in the distance are hills of Chugaku mountains and Kikaku-no-taki, an artificial waterfall. Nakane successfuly incorporated both features into his design. Thanks to skillfully placing rocks and trees, he was able conceal from view a nearby highway, rice fields and houses. As a result the hills and the waterfall appear to be a part of one composition. This technique, referred to as shakkei or “borrowed landscape” and often employed in Japanese gardens, creates the illusion of depth and perspective. — the garden appears much bigger than it in fact is. Meticulously clipped, rounded azaleas and dwarfed pines, shaped so as to resemble hills and mountains, further add to the illusion of almost infinite space. Located next to this karesenusi garden and fitted beneath stone bridges is the Pond Garden, which features koi carps in its waters as well as a tea house. Inside, traditional tokonoma alcove has been left open, affording a framed view of the adjacent White Gravel and Pine Garden. Tokonoma alcoves traditionally feature a hanging scroll of calligraphy or fine art. Here, left open, the alcove features a “living scroll” affording an ever changing view of the adjacent garden. That latter garden was inspired by Yokoyama Taikan’s “Hakusa Seisho” or “Beautiful White Beach,” one of Adachi’s favorite works of art. The white gravel and black dwarf pines (kuro-matsu, Pinus densiflora) represent the famous coastal scenery of Awaji Island and the Kii Peninsula of Wakayama which Taikan painted. Perhaps most intimate in the Adachi Museum is its moss garden where a sea of pale gravel flows between shapely islands of verdant green.. Tall red pines (akamatsu, Pinus densiflora) and maple trees (momiji, Acer palmatum) provide ample shade to the cedar moss (sugigoke, Polytrichrum juniperinum). The pines were personally selected by the museum founder and brought here from a mountainous area, where, they had grown at an angle. Replanted in the same way, they give Adachi garden a unique, slightly idiosyncratic look.